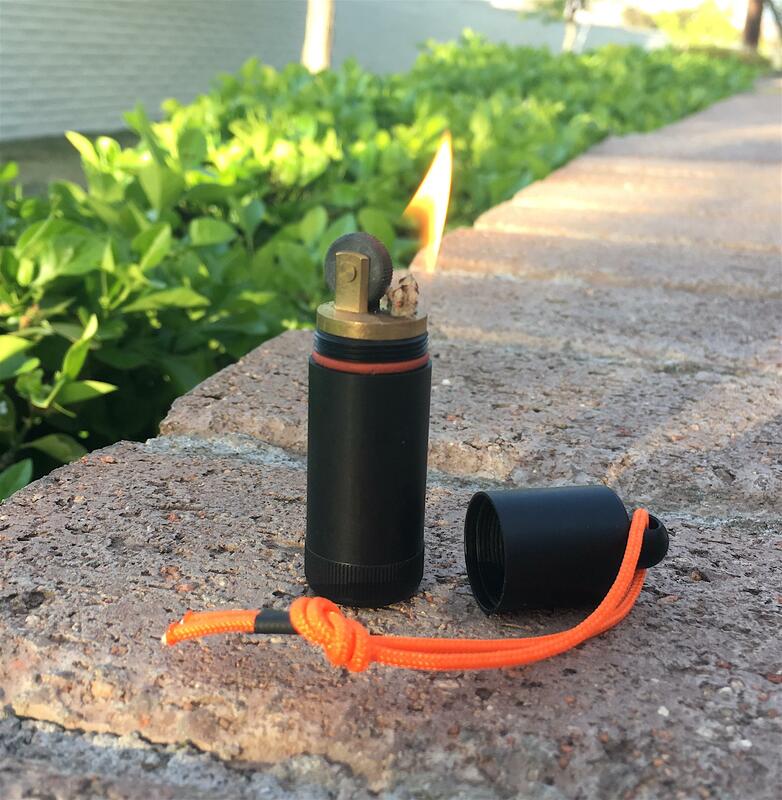 I've become interested in the arc/plasma/flameless/Tesla lighters recently and purchased one of the KOBWA lighters to try it out (sort of an electric version of a windmill lighter). If you haven't seen these lighters before, they use electricity to create a very hot plasma arc between contacts, no fuel required. So far, the battery in mine holds a charge quite well (although I don't use it very often). The appeal was that it can be recharged via USB, and I have plenty of battery packs, plug adapters, and even solar which I can use for that. I've just ordered another one, made by RONXS, with a flexible neck to use around the house (candles, grill, firepit, etc.). The main drawback with mine (and with many others) is that they're really best suited to lighting cigarettes. The lid doesn't open very far (some of them don't even open 90 degrees), the arc doesn't reach out beyond the electrodes, and in some cases (like mine) the button to activate it is next to the electrodes. On mine, the charging port is next to the electrodes as well, which means it could be exposed to fire and smoke, which might eventually damage it. The longer necked ones do a better job of being used for things like lighting fires, candles, stoves, etc., but come with the drawback of size. The one I just ordered is nearly 10 inches long vs 2 5/8 inches for the KOBWA. Not nearly as portable! Still, it's another option to try out. I snagged the County Comm XL Peanut lighter, and decided to begin testing how it stacks up to the IMCO and Zippo for fuel evaporation. By comparison, both the IMCO and Zippo lost 1.9g fuel over 1 week, resulting in a 12 oz can lasting 3 years. Overall what this says is that the XL Peanut is a much better Survival / SHTF lighter then the Zippo or IMCO in terms of fuel efficiency. The XL Peanut lighter insert is also much higher in quality construction then the regular Peanut. The striker wheel is larger and better secured with a rivet, and the brass body is much more securely attached then the cheap regular inserts. Can't wait for these to come back in stock. EDIT - I was looking at the titanium versions that the XL wasn't in stock. These are nice for 20 bucks. It doesn't say. Do these take standard flint? I went with the Aluminum version, although if I were doing it all over again I might spring for the Stainless, as I think stainless steel threading will last longer over the long term. Titanium is a total waste though for these. I keep 3 extra flints in the bottom cotton of the XL peanut, which is about as much as can fit. In my Zippos and IMCO's I like to keep 5-6 flints in the cotton. Even after these lighters are out of fuel, the flint allows them to be used like a "Spark Lite" for igniting wax impregnated jute twine and other easy to ignite prepared tinders. I plan on replacing the orange lanyard on my XL peanut with a 12" length of Waved Jute for that very reason - even if the lighter is out of fuel, I'll still be able to light a fire. For long term (ie over 5 years) storage, I would recommend storing the lighters without a flint inserted into the mechanism, but with just the flints stored in the cotton. I collect vintage lighters, and many of the New Old Stock lighters I buy are in perfect condition - but have a corroded flint stuck in the flint tube. In a survival situation they would be really hard to dislodge - it takes about an hour or more with a fine wire pick, or a power drill, to remove a stuck flint. One thing I plan to look more into is a smaller bottle for Zippo fluid, something that could be kept in a smaller bag. I think a 30ml E Juice bottle for Vaping might work, I'll report back down the road. Do you think similar results could be had by the simpler expedient of wrapping the exterior of a zippo lighter in duct tape? The metal of the case itself should be gas tight, perhaps all that's necessary is to seal the seam while the case is closed. If that works it should also prevent the exterior of the case from accumulating a film of fuel. Zippo fluid is useful for removing sticky residue from objects. Another lighter I recommend is the Aomai AM127. 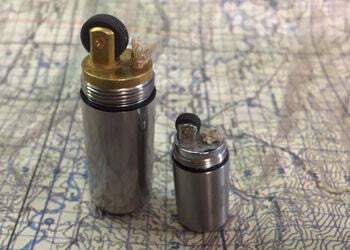 Design wise, its based on the classic Windmill outdoor survival lighter, but slightly larger. While Windmill lighters are known for their "invisible" windproof jet flame, the Aomai uses a catalyser screen that is lightly coated in a chemical like strontium to color the flame a slight red- purple. This typically lasts for the first 100-500 ignitions, then starts to fade as the chemical burns off. Overall, the AM127 is a superb lighter for the money. It offers most of the functionality and reliability of the Windmill, but at less then 1/10th the cost. Its wind resistant to 40mph+, much moreso then a regular jet lighter. and with good butane I've had one last for years, and it still lights first time every time. Best of all, its only $3 from China, vs $30-$40 for a Windmill, so you can afford to buy multiples. I got that Aomai AM127. It's a pretty cool. I'm diggin it. Been using it for a week now. Nice red flame. Perfect size. I put lime green 550 cord on it. So as not to lose it. Holds a lot of fuel. I wonder how many lights you would get out of this thing? So glad the Aomai is working out for you. I've been very impressed with mine - amazingly close performance to the Windmill at less then 1/10th the price. In terms of fuel life, I haven't measured, but would suspect about 250-300 ignitions per fill, as thats what the Windmill averages. Best way to tell is to weigh the lighter empty (ie 28.7g) then weigh it fueled (ie 29.7g). Then light it 50x over the next couple days, using your normal 1-3second ingnition, then weigh the lighter after. So if the lighter holds 1g fuel, and 50x ignitions reduces weight by .2g, then you can assume 250 ignitions per 1g fuel. I've never had one, but I've always been skeptical of those because you just end up with an ember rather then an actual flame. I think a XL peanut + Waxed Jute lanyard is the way to go. When fueled, its a lighter. If its out of fuel, 12" of 5 strand wax just will produce 30x 2" "jute matches" that can be ignited by the spark wheel of the flint lighter. I don't understand your last sentence. And I think it's important. My experience with rope lighters dates back thirty years when I played with a couple ww1 era examples in my FIL's lighter collection. But after I posted that I found that exact rope lighter for about $7.00 on Amazon and ordered one. I'll let you know after it get's here and I try it out. Which may not be for awhile. It's on the slow boat from China. You get some 5 strand jute twine, let it soak in melted parafin wax, and then let it dry. Once dry you have a cord that can be used as a lanyard, then untied and used as a firestarter. 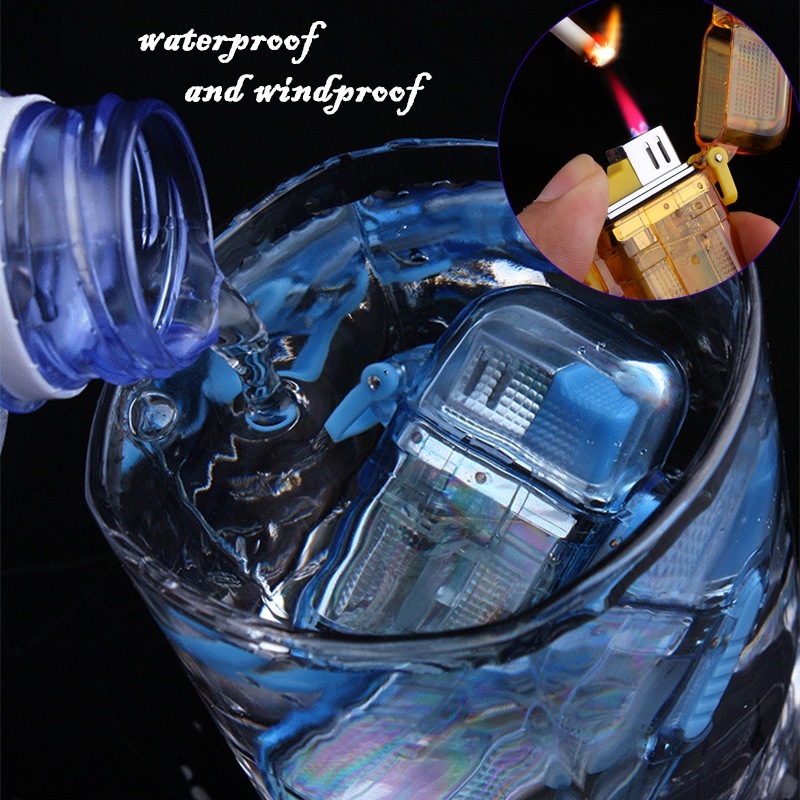 Its completely waterproof and can be lit by the flint from an empty lighter (although a dedicated Sparker like the SparkLite works even better.) Pretty much the best tinder available, and very simple and cheap to make. If you're using 5 strand jute, each individual strand can be used as what I call a "jute match." You get a 2" section, frizz up 1 end of the jute with your fingers so that it can catch a spark, then your ignite it with a spark from the empty lighter or sparklite. And each one of these 2" sections will burn as long as typical wooden match ie 7-10 seconds. And a complete 2"x5strand section will burn for around 2 minutes, the same as a SparkLite tinder tab, but a lot more waterproof. --> If you take a 12" length of 5 strand jute, you can make a little lanyard for your XL Peanut lighter. If you run out of fuel, you just untie the lanyard, slice it into 2" sections, and now you have up to 30 "jute matches" worth of fire. Cool, I'm curious to see how it performs as a firestarter - ie can it light something like a rubber band on fire?